The Diet of Worms was an assembly of the lords of the Holy Roman Empire called together by Emperor Charles V in 1521. One of the duties of the Diet was to consider whether the writings of Martin Luther were heretical. The Diet marked the point-of-no-return for the Protestant Reformation. Luther’s ringing statement “Here I stand” reclaimed the spiritual freedom of the individual. Henceforth each person could choose to interpret scripture and to commune with God without the necessary intervention of the church. However, Luther’s actual concept of freedom was far more complicated than this. Martin Luther was an Augustinian monk who studied, taught and preached at the University of Wittenberg in Saxony, one of the states of the Holy Roman Empire. The engraving on the right by Lucas Cranach the Elder shows Luther in his monk’s attire. Cranach was the court painter for the Elector of Saxony. He knew Luther well and made several portraits of him. This engraving was used as a frontispiece for several of Luther’s early books. 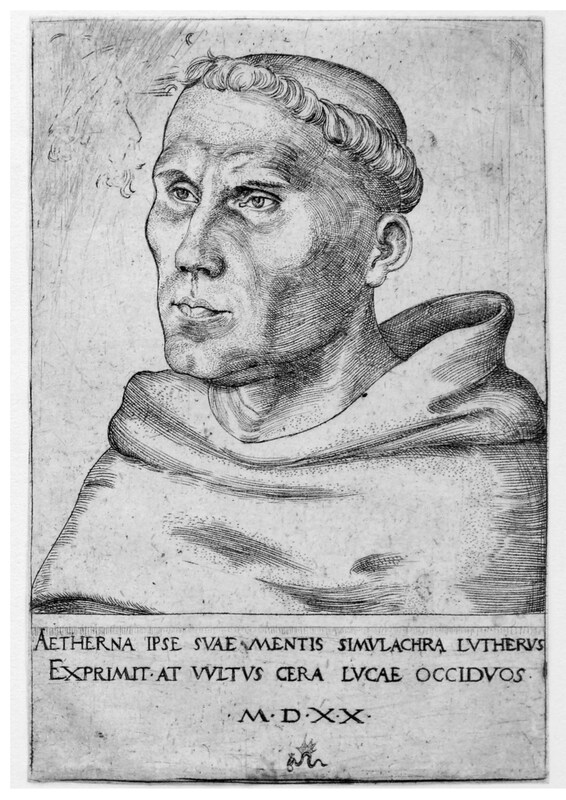 The Latin beneath the portrait states that Luther’s depiction of his thinking was eternal but Cranach’s portrait of his features only transient. At the bottom is a device used by Cranach as his signature – a winged serpent with a crown upon his head and a ruby ring in his mouth. In 1518, Luther was arraigned in Augsburg before Cardinal Cajetan, the papal ambassador to the Holy Roman Empire. Cajetan insisted that Luther’s views were heretical in that they questioned the authority of the pope. He asked Frederick the Wise, Elector of Saxony, to arrest Luther and send him to Rome. Frederick refused to do so since Luther had not been formally tried and convicted of heresy. In 1519 Luther debated on the 95 theses with Johann Maier von Eck in Leipzig. Luther insisted on the freedom of the individual to decide what was right on the basis of the scriptures and conscience, whereas von Eck insisted on the need for obedience to God’s church. Their debate had no resolution. Over the next year, Luther published several books highly critical of the Roman Catholic Church (Mullett, 1985, Chapter 5). 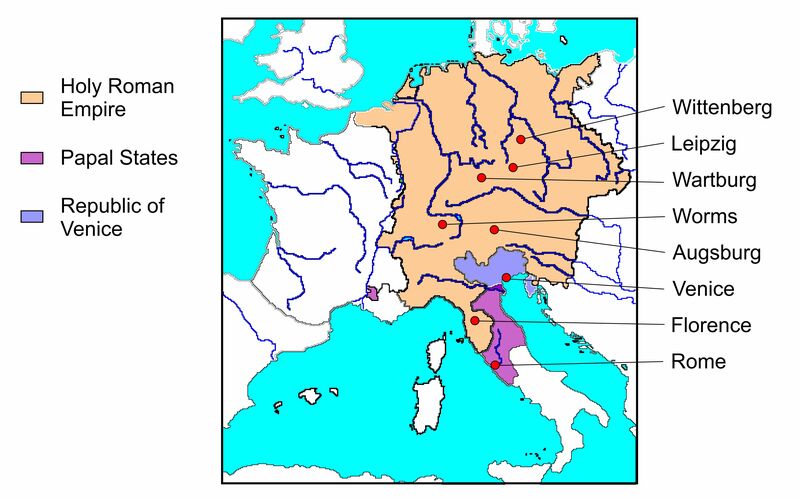 His Address to the German Nobility proposed that the German states should become independent of Roman control and not send Rome its annual payments. The Babylonian Captivity of the Church was a vituperative attack on the papacy, likening it to the power of Babylon and the Antichrist described in Revelations. A Christian is a perfectly free lord of all, subject to none. A Christian is a perfectly dutiful servant of all, subject to all. Christians were granted freedom from sin through the grace of Christ. Nevertheless, they must then act not for themselves but for the benefit of others. Freedom comes with duty. In the summer of 1520, Pope Leo X issued the bull Exsurge Domine (Arise Lord), which listed the heretical ideas proposed in Luther’s writings. The pope requested that Luther come to Rome and recant; failure to do so would result in his excommunication. 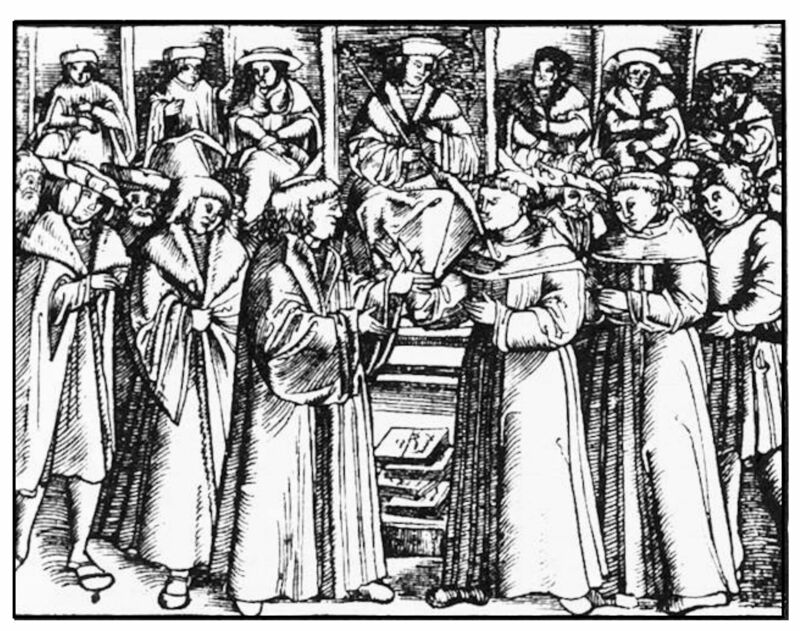 The pope arranged for the burning of Luther’s books in Rome. In Wittenberg, a defiant Luther publicly burned his copy of the papal bull. The pope assigned Cardinal Girolamo Aleander the task of bringing Luther to trial. His task was facilitated by the coronation of the new Emperor Charles V in November, 1520. Anxious to display his faith, Charles agreed to bring Luther before the Diet of Worms in the spring of 1521. Frederick the Wise of Saxony insisted that Luther be guaranteed safe conduct to and from Worms. 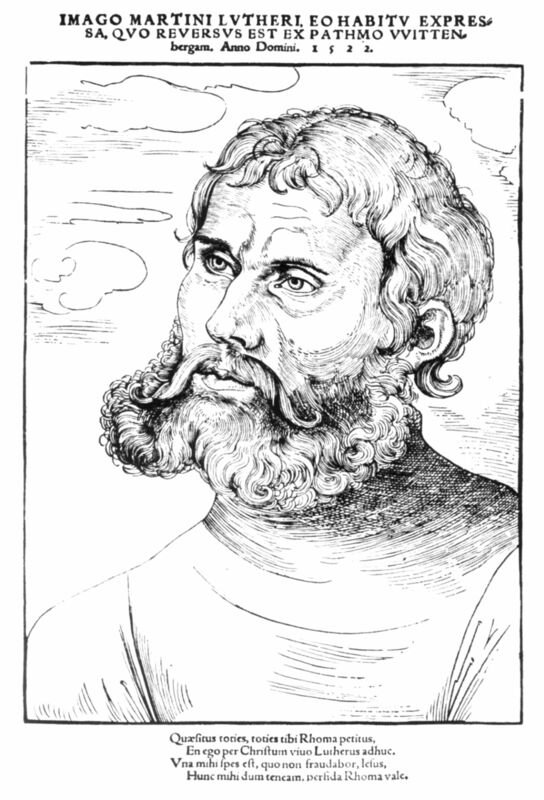 Luther appeared before the Diet on April 17. Since Cardinal Aleander did not allow himself to be in the same room as a confirmed heretic, the examination of Luther was conducted by von Eck, who had previously debated Luther in Leipzig. The following woodcut by an anonymous artist (from a Freiburg History webpage) was used to illustrate one of the early reports of the Diet. In the background is Charles V surrounded by six electors (Frederick of Saxony, Joachim of Brandenburg, Ludwig of Rhine, and the Archbishops of Mainz, Trier and Cologne). The seventh elector (from Bohemia) was not present. In the foreground Luther stands on the right and von Eck on the left. In the center are Luther’s books. Unless I am convinced by the testimony of the Scriptures or by clear reason (for I do not trust either in the pope or in councils alone, since it is well known that they have often erred and contradicted themselves), I am bound by the Scriptures I have quoted and my conscience is captive to the Word of God. I cannot and will not recant anything, since it is neither safe nor right to go against conscience. May God help me. Amen. (Brecht, 1985). Some reports include the statements “Here I stand. I can do no other.” (Hier stehe ich. Ich kann nicht anders) before “May God help me.” These words were certainly in the mind of Luther. Whether or not they were actually spoken is unknown. Most experts think not. The results of Luther’s examination before the Reichstag was published as the Edict of Worms in May 1821. Luther was denounced as an “obstinate, schismatic heretic.” He was to be apprehended and punished. Those favoring or supporting him would be guilty of treason against the empire and would forfeit all their goods. All of Luther’s books were to be burned. Luther found the seclusion in Wartburg a relief from the disputations and polemics of the preceding years. He considered it his Patmos – the island where legend has it that St. John wrote Revelations. During his retreat in Wartburg, Luther translated the New Testament into German. In March 1822 he returned to Wittenberg. Frederick the Wise had negotiated with Charles V that the Edict of Worms did not apply to him. The young emperor did not wish to alienate one of the most powerful princes of his empire. Luther resumed his teaching and his writing. One of his works on his return was a reply to the book On Free Will (De Libero Arbitrio), published in 1524 by Desiderius Erasmus, the humanist scholar. Erasmus was actually reacting to Luther’s earlier scriptural interpretations that man had no free will. The papal bull Exsurge Domine had listed this claim as one of Luther’s heresies. Luther had replied in an Assertion of all Articles: “free will is really a fiction and a label without reality because it is in no man’s power to plan any evil or good … everything takes place by absolute necessity” (Winter, pp. 44-45). All that mattered to Luther was salvation through the grace of God. Erasmus recognized the grace of God but insisted that we could accept or reject this salvation. Furthermore we could choose to do either good or evil. Why would the scriptures exhort us to follow God’s commandments, if there were no choice between obedience and disobedience? Luther proposed that the purpose of the commandments is simply to demonstrate that man cannot obey them without the grace of God. Luther interpreted the words of Paul as irrefutable truth. He had replaced the authority of the Church with the authority of the scriptures. There is no reason to accept either. Both represent incomplete attempts to understand how we should act. These ideas bring into question Luther’s statements at the Diet of Worms. According to our understanding, we exercise free will when we choose to act in one way when we could have acted otherwise (van Inwagen, 1983). Typically this requires “deliberation” – we imagine the outcomes of our possible acts, and evaluate these against our principles of what is good or right. One of the great paradoxes of Judeo-Christian thought is how free will is possible when God knows everything that will happen. In our modern and more agnostic times, this paradox has been transformed. Now we wonder whether free will is possible when science proposes that everything is determined. Most consider that free will and determinism are compatible but it remains unclear how this can be so. Much of what we do occurs without thinking. We often respond instinctually or reflexively. Sometimes we do things for reasons of which we are unaware. After the act we invent rationalizations for our behavior. Nevertheless, we remain convinced that some of our actions are truly deliberate. We choose to do them because we have thought carefully about the consequences. Various options are freely available to us. We select what we think is best. We try to do the right thing. Luther had deliberated overnight whether to recant. In the end he decided not to. Yet he believed that this decision was not his. He was merely acting out God’s preordained will. He could do no other. Luther had constructed his personal system of values from his interpretation of the scriptures. This set of values had determined his decision. He attributed his ideas about what he should do to God. He did not say so for fear he might be wrong. For he had conceived these ideals, and he chose to follow them. He could have done otherwise. Atkinson, J. (1971). The trial of Luther. London: Batsford. Bayerische Akademie der Wissenschaften. (1962). Deutsche Reichstagsakten: Jüngere Reihe. Göttingen: Vandenhoeck & Ruprecht. Volume 2. An earlier version (1896) is available online. Brecht, M. (1981, translated by Schaff, J. L., 1985). Martin Luther. His road to reformation. 1483-1521. Minneapolis: Fortress Press. Luther, M. (1520, translated by W. A. Lambert & H. J. Grimm, 1999). The freedom of a Christian. From J. J. Pelikan, H. C. Oswald & H. T. Lehmann, Eds.). Luther’s works, Volume 31 Philadelphia: Fortress Press. Mullett, M. A. (2004). Martin Luther. London: Routledge (Taylor and Francis). van Inwagen, P. (1983). An Essay on Free Will. Oxford: Oxford University Press. Whitford, D. M. (2011). Luther: a guide for the perplexed. London: T & T Clark. Winter, E. F. (1961). Discourse on free will. New York: Ungar. This is an annotated translation of Erasmus, D. (1524). De Libero Arbitrio, and Luther, M. (1525) De Servo Arbitrio.